In this week’s episode, Scott and I sat down with Dave Cournoyer and Duncan Wojtaszek to discuss “the deal” with Canadian politics. What is it that keeps voters away from the polls? Why is there such a disconnect between voters and politicians? 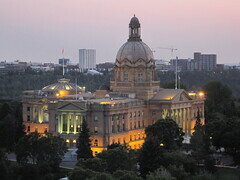 Is there any hope for the electoral and governance systems in Alberta and Canada? I think we may have even gotten a few words in there about Star Trek, as part of my nefarious plot: to make this podcast about Star Trek at all costs. Send us your comments, questions and show suggestions. And enjoy the episode!